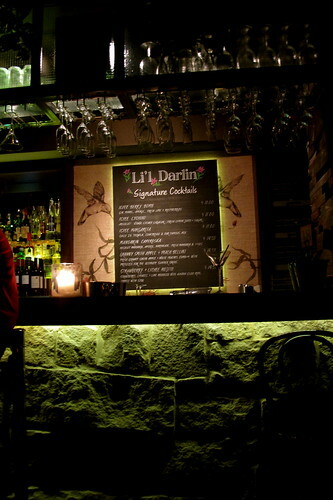 You gotta love a good bar like this. It’s nothing extraordinary but it just does what a good bar should do, ticking the right boxes with delicious bar food, scrumptious pizzas, alcohol and thankfully, plenty of seats. It’s buzzing on a Friday night with people kicking off their weekend escapades with spots at the bar, down the communal marble table, seats by the window or the cosy little two-seaters along the wall. 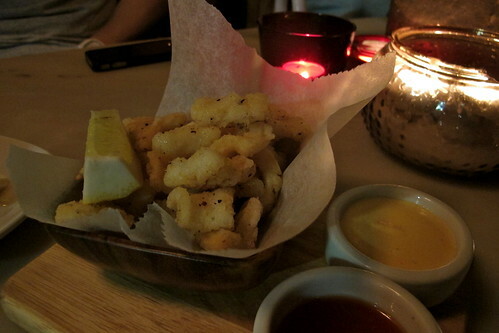 Feeling the generous and sharing mood, we’re kick off with some you-can’t-say-no salt and calamari with a side of sauces; delicious and piping hot bite sized pieces. Nothing amazing but it’s hot and fresh, and not elastically, so that’s comforting. For something a little spesh, it’s the seared scallops. It’s not long when they arrive on a bed of cauliflower puree, crispy pancetta pieces, lime, tomato and a drizzle of brown nut butter sauce danced around on my tastebuds. Delish. Continuing the two person chow down, next up are the messy and saucilious pork ribs. 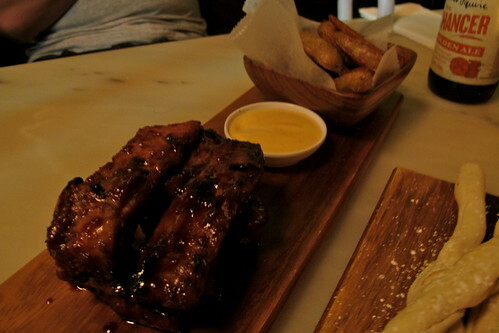 They pull off the bone with no trouble and are coated in Li’l Darlin’s signature chilli BBQ sauce. With our saucy grins and BBQ smelling fingers, we dive into the side of kipfler potato chips with aioli. Mmmm! And when you read crispy peking duck pizza on a menu, you really can’t go past without ordering (plus having a food blogging colleague always helps, hello!). The pizza is crispy thin with lashings of peking duck, hoi sin sauce, shallots, cucumbers, coriander and the magical hints of star anise and cinnamon glaze that ties it altogether. Definitely giving Mad Pizza e Bar up the road a run for its money! 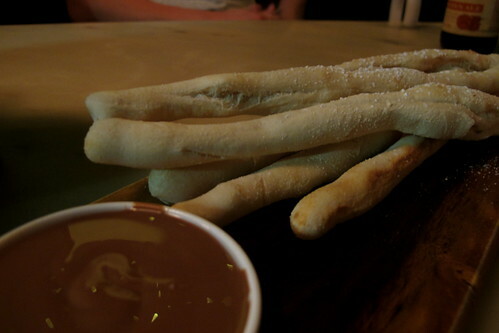 The dessert menu is still sadly very short and it calls for the home made dough sticks. If you’re a lover of fresh bread then this is a treat. Warm, doughy goodness dipped in Belgian milk chocolate is not bad, not bad at all. hot damn i could go for some chilli pork ribs right about now! Did you go to messina nextdoor afterwards? I was stuffed to the belt after having pizza and so many dough sticks! I did stand and stare at them making a bomb alaska which looked amazzzzzzing! 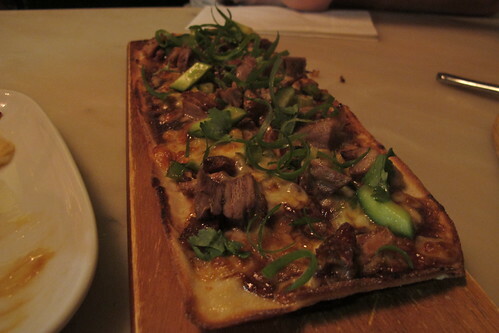 The crispy Peking duck pizza seems like a creative twist. 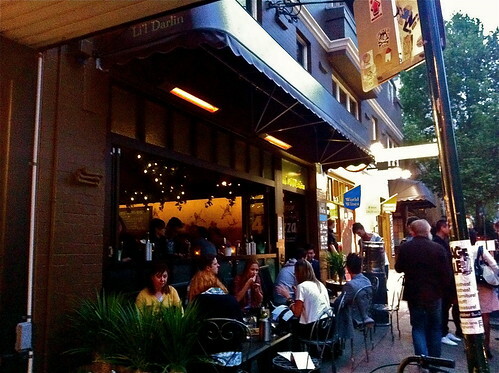 Food seems to be getting very innovative in Sydney especially among the newer restaurants. Importantly, I hope it tastes as good as it looks. 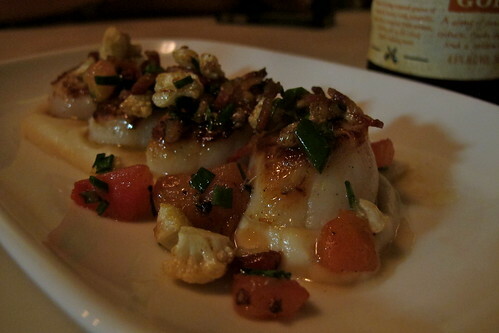 those Seared Scallops look amazingly tasty!!!! omg that seared scallops looks sooooo good!